G-Code has rolled out a very limited run of what is called the “Blood Stripe” series. This series supports the MARSOC Foundation. A portion of every holster sold will be donated to the foundation in support of their efforts to support those who have sacrificed so much for the rest of us. These holsters look fantastic in the pictures, and in person they even better. We are only going to offer these for a short time. A very short time. So if you are thinking about getting one, just jump. Because when it’s shut down, it’s done. All orders are processed online. As are the guns they are available for and pricing. Check G-Code’s site. If you have any questions, contact support@tacticalholsters.com. I earned my blood-stripe for my USMC blues in the 80’s. Friction retention? Have you used this holster, Ogre? I have no qualms about friction retention, just curious about “hands on” experience. I like the RTI concept, but I don’t change carry weapons with my pants, so to speak. 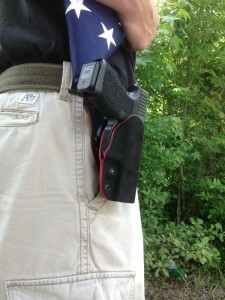 Pics of the holsters, specifically the OSH Standard, only show the outside. Are there pics of non-RTI holsters from the belt side? How do they carry? How do they sit? What kind of profile or print do they make? Yes, I’ve used these holsters. They are EXCELLENT. I’ve been using G-Code for years as I helped the development of the original G-Code way back when. Been using them ever since. All my mag carriers are G-Code. Save one, which Steve Ting sent to me recently. I’ve always had a G-Code for 1911 and I’ve had a G-Code REAC rig for my Beretta since the first time I had a Beretta. And you might not change guns…. bbt the RTI system allows you to change location of your gun, from belt to vest to console of vehicle SAFELY because you are not drawing your weapon. Hell, I want to put an RTI wheel in my bathroom. Next to the TP Roll. Know what I mean? If you don’t need the RTI, you don’t have to get. Belt slide and paddle options are there. You had to go bathroom mount. “Dress-blue” fuzz isn’t an option, though, eh?